Here’s a little tip and technique on how to increase the head room in your hammock, especially for gathered-end hammocks with integrated bug nets, such as the Grand Trunk Skeeter Beeter series, Hammock Bliss No-See-Um No More, and the Byer Moskito Traveller, to name a few. This side tie-out also works great for any hammock that lacks side tie-outs. The trick here is to snap the pull-out near your shoulder area and as close to the edge of the hammock fabric as possible. I tested this on my Hammock Bliss mosquito hammock and placed it right near the zipper. It works great! Let me know how it works for you. This illustration highlights the DutchWare clip on tarp pull outs, but there are other options available that will work. These “alligator”-type clips could work, but it puts more abrasion on your tarp or hammock that could cause tears, especially for tarps made of lightweight materials like silnylon or light polyester. The donut style illustrated is much more gentle. A dime or pebble and a piece of string work just as well for free; also with less added weight if you grab a pebble from your campsite for the microgram counters put there. Hi, I have a Grand Trunk UL Skeeter Beeter. It has four loops attached to the bug netting, for running two ridge lines (one on either side) which I’m hoping to replace with just one. 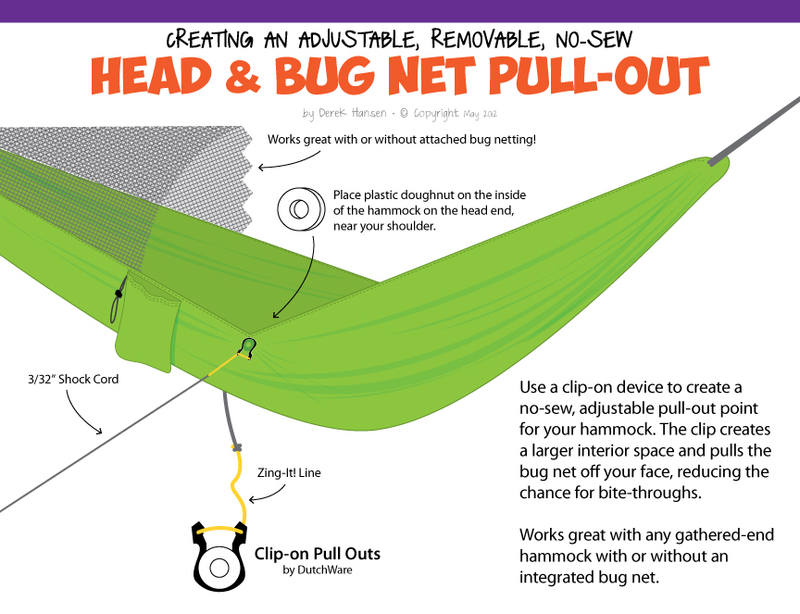 Do you think this technique might work for supporting the bug netting down the hammock’s centerline? Any concerns the netting wouldn’t hold up? Yes. It will work. I’ve also done it by taking two lengths of shock cord and tied them to the loops and then pulled them out to the end of the hammock. So no ridgeline needed and no line between the loops. I hope that makes sense. Yeah, that works great! You really know your stuff. I will check out your book. Thanks again. Decades ago I’d carry extra line and PING-PONG balls to make low-stress attachment points.